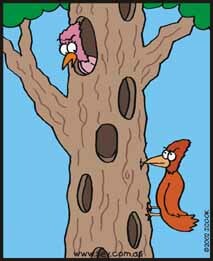 The Twist Cartoon Contest is a weekly competition where YOU enter the caption! Read last week's cartoon (Hanggliding bird). Tim Monti Wohlpart 4.4 Red would prove to Animal Planet and the whole world that he could be every bit as menacing as any crocodile. Submit your punchline here. We recommend you read our Guide to Funny Punchlines (in particular, avoid rehashing punchlines). Submitted punchlines Now I would never recommend plagiarism (after all, what artist has ever done that?!) but your creative juices might get flowing after a look at some of the submitted entries or the Punchline of the Day. Read archived winning captions of past contests. How to Write A Funny Punchline Consult my guide which gives practical advice on writing cartoons. While directed at comic strips, it contains principles that apply to single panel cartoons. Sev Guide to Cartooning Find general advice, hints and resources for cartoonists. Includes links to many how-to-cartoon web sites.